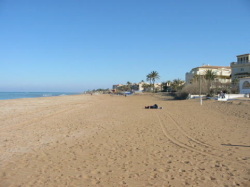 If you are looking to rent a holiday apartment in one of Spain's most prestigious areas you have come to the right place. Our holiday apartment is one of only thirty properties on a totally secure complex. Whilst the resort is peaceful and established you can enjoy all kinds of activities close by including tennis and horse riding as well as other sporting activities. The 5* Marriott Hotel, 18 Hole Golf Course and Spa which has recently been built on the La Sella resort is literally 10 minutes drive from the complex. La Giralda built in 2001 is a well established quiet residential area just over two miles to Denia Town and only 500m (5 minutes walk) to the beach and restaurants.